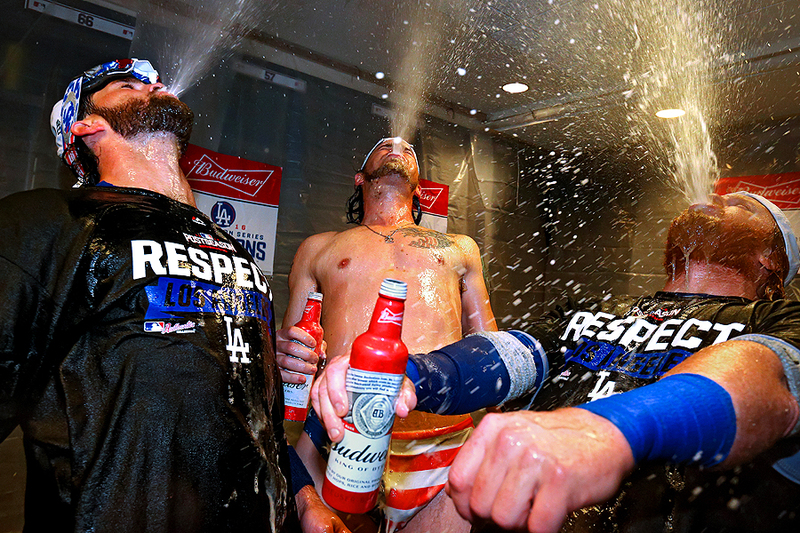 "Adrian Gonzalez #23 (L), Josh Reddick #11 (C) and Justin Turner #10 of the Los Angeles Dodgers celebrate in the clubhouse after winning Game Five of the National League Division Series over the Washington Nationals, 4-3, at Nationals Park on October 14, 2016 in Washington, DC." As excited as everyone was for playoff baseball to begin - it has ended in Washington, DC. While the actual post season hasn't ended, my year of documenting baseball has come to and end as the local two teams are now out of contention. The other night the Los Angeles Dodgers won Game Five of the National League Division Series over the Washington Nationals. With any clinching win, there is celebration, and I had the great opportunity to get into the clubhouse to document the jubilation. These moments behind closed doors of fans is always a challenge. The biggest difficulty is trying not to smile too much behind the camera as these mega athletes enjoy and let loose as they take another step closer to the World Series and possible title as world champions.